The SpeedComforts for convectors are supplied with easy-to-assemble feet. The effect of the SpeedComfort is increased when placed on these. The feet ensure the magnets in the side of the housing cannot touch the outer wall. This is important to prevent contact noise. 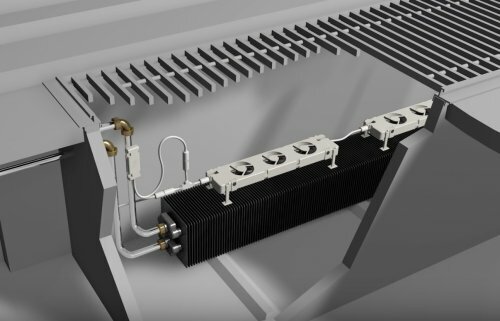 Ensure the SpeedComforts are always placed away from the metal parts on the convector. You can connect up to twenty SpeedComforts to one adapter in series. They are switched on and off simultaneously by one thermostat switch. If a bulkhead is placed in floor ducting, the supplied 30 cm connection cable may be too short. The e-shop contains 0.60 and 1.20 m cables. The SpeedComforts on feet can be used in floor ducting. 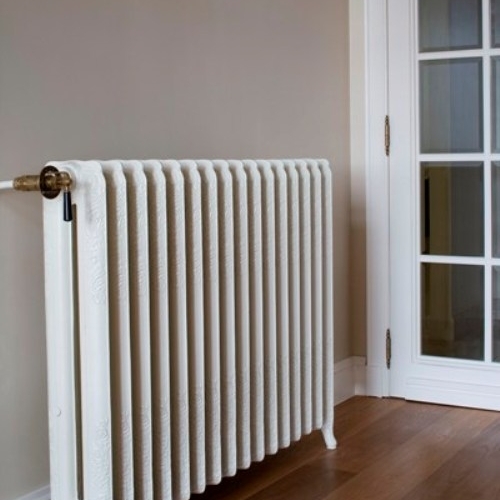 This version of the SpeedComfort can support old cast iron radiators with fins. The SpeedComforts are placed on the feet on the floor under the radiator. The external thermostat switch is attached close to the hot water supply pipe with magnets.